I just don't know how I feel about this trend on me - but I'm definitely willing to try it because it looks awesome in these looks! I'm not too sure about this trend. I don't think I'd be wearing it just cos I don't have the best legs for it, but I guess it might look really good on others! Only time will tell! I remember seeing the polka dot ones at CDG, I love them but I just don't have the figure to pull them off I'm afraid, my legs are too short! Ha! can i just say that a short legging scares me? but i'm sure it will grow on me with time! thanks for keeping me updated! 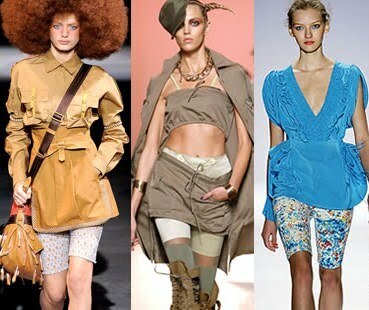 I'm all for layers but I don't think I could ever wear short leggings that peeped out from under my clothes. great photos. love the looks. ah le cycliste! en tout cas les photos choisies sont tres belles et me donne envie de soleil! 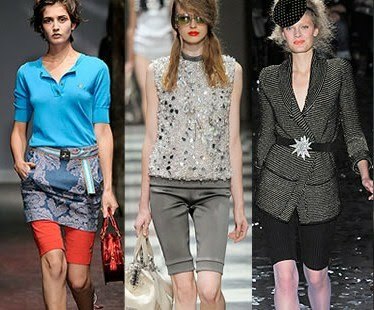 I'm back and forth on this trend, but ultimately I can think of some scenarios where the bike short could be worn well. Lace bike shorts under a full or frilly skirt, for instance, or peeking out from under fuller shorts. As long as the proportions are considered, it could be a fun trend.